At the end of 3 major dialogues in 2017 and 2018 held by CAPI to examine “Barton Forward: Optimizing Growth in the AgriFood Sector”, it became clear that growth for growth’s sake will not be enough but rather will require a perspective shaped or characterized by optimizing growth through enhancing natural capital and adopting innovation. “Quality” growth is needed to ensure that the gains in the agri-food sector can be sustainable. In agricultural production, soil use and soil quality connect not only to farmers’ choices among competing enterprises, such as crops vs livestock, and management options but also to biodiversity, to air and water quality and, through carbon sequestration, to climate change. The key question is “how can land use be optimized in such a way to improve environmental and social outcomes while maintaining and improving the sector’s long-term competitiveness and securing “quality” growth?”. 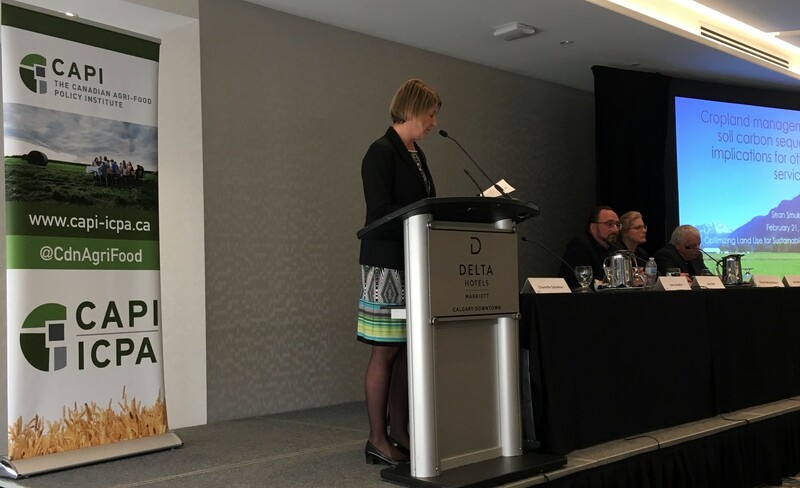 To seek answers, CAPI convened its first dialogue with the participation of experts from industry, governments, academia and other research groups to commence a conversation on “Optimizing Land Use for Sustainable Growth” on February 21-22, 2019 in Calgary AB. With 100+ participants from government, producers, processors, academia, industry associations, and NGOs across Canada, the day was a great success raising awareness about land use practices and their impacts on GHG emissions, air and water quality, and biodiversity as well as on sector initiatives to improve sustainability and competitiveness. What’s more, this thought-provoking dialogue engaged various sector actors, bringing together opposing views in a collegial environment. Judging by the questions and comments from the floor and the full room until the end of the event, the topic “hit a nerve”. Dialogue participants developed a shared understanding of the options available to optimize land use for sustained growth and long-term competitiveness. This event was the success it was because of the great speakers, discussants and actively engaged participants, including next gen’s, who contributed to this important CAPI conversation. CAPI thanks all of you who attended. SESSION 7 – Wrapping it up: Is there a clear way forward for optimizing land use for sustainable growth? Are crops and animals in direct competition to reach higher sustainability outcomes? What direction and instruments are most promising for crop production sustainability outcomes? What direction and instruments are most promising for livestock production sustainability outcomes?